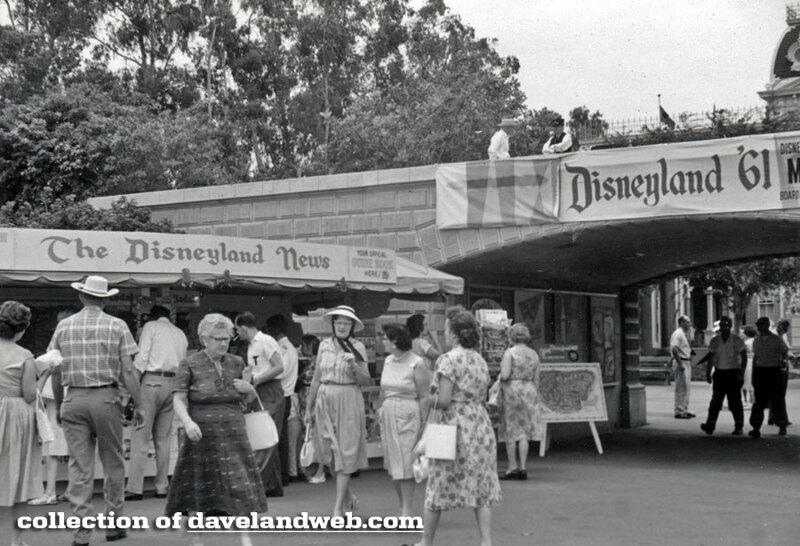 I am digging this 1961 black and white image of the Disneyland News Stand near the entrance tunnel into the Park. 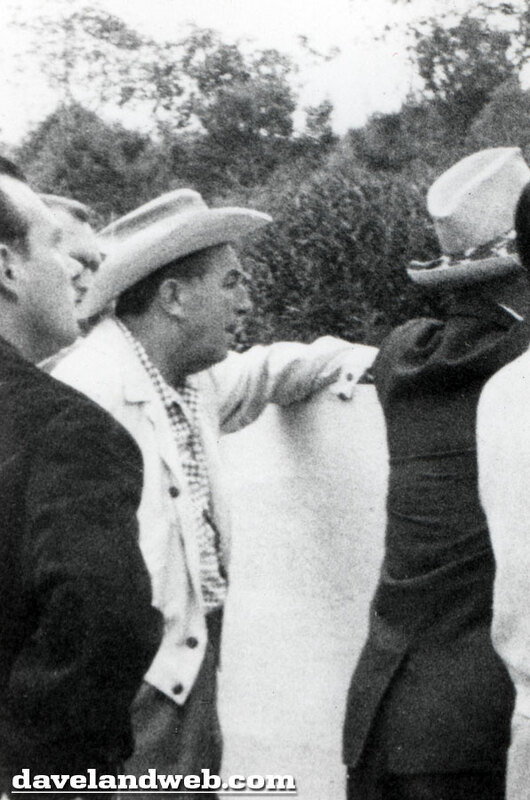 I secretly hoped that the gentleman in the hat was Walt, but upon closer examination, I don't believe so. 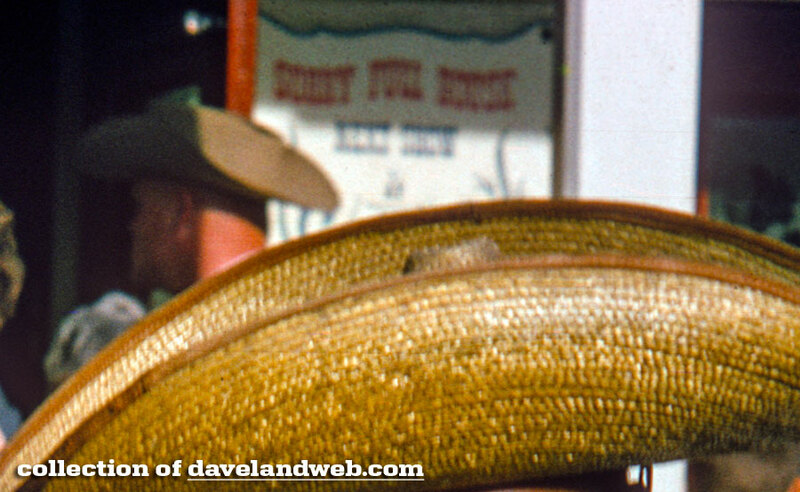 Although Walt wore hats like that, the face and body seem a bit off. So much from just one little image! 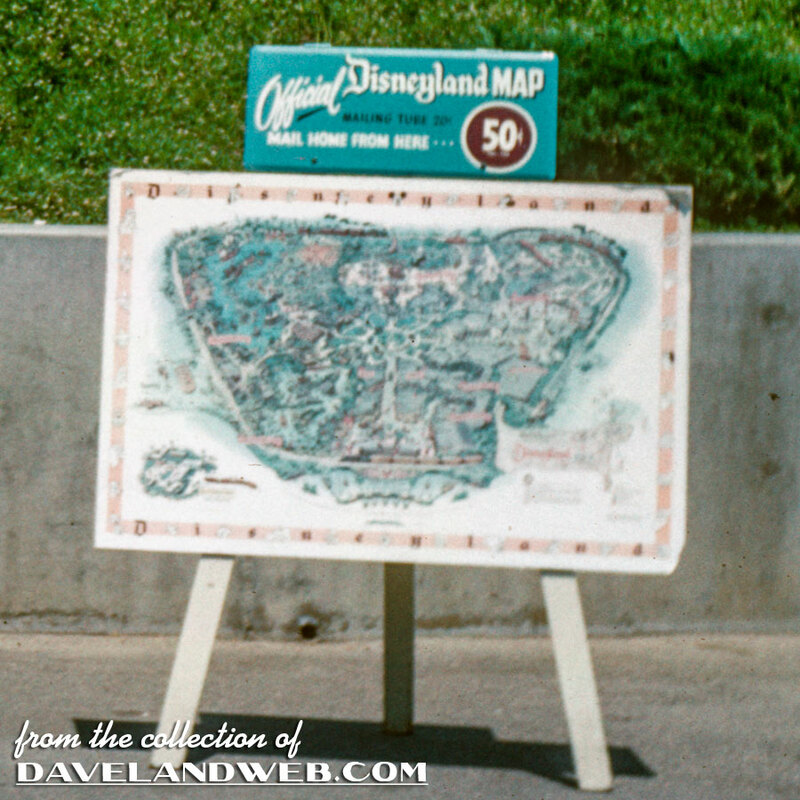 See more Daveland vintage & current Disneyland entrance photos at my main website. 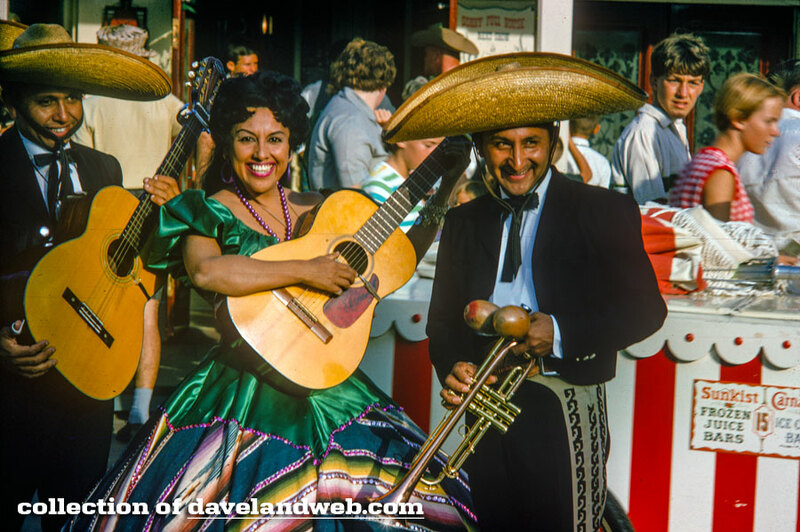 Standing in front of Disneyland's Golden Horseshoe Saloon are the Gonzalez Trio, circa 1960-something. The sign behind them reads “Sorry Full House…next show…” (thanks Steve!). I wonder if they every have to use a sign like that at the Horseshoe these days? 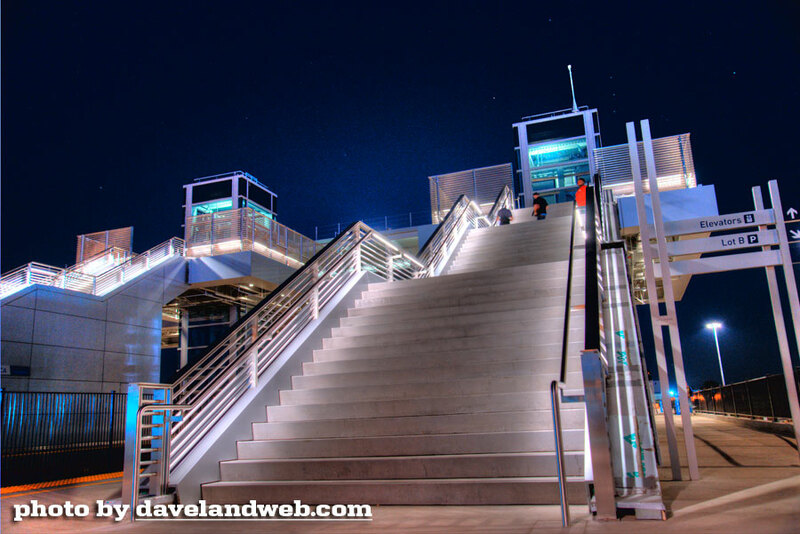 See more Daveland Gonzalez Trio photos at my main website. 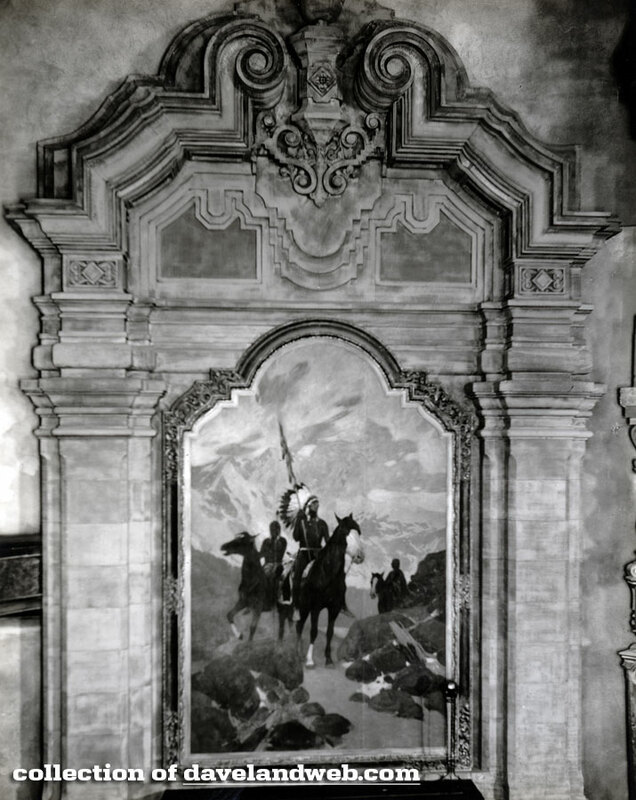 The Carthay Circle Theatre on San Vicente Boulevard in Los Angeles was arguably one of the most famous movie palaces of Hollywood's Golden Age, known for its lavish movie premieres. 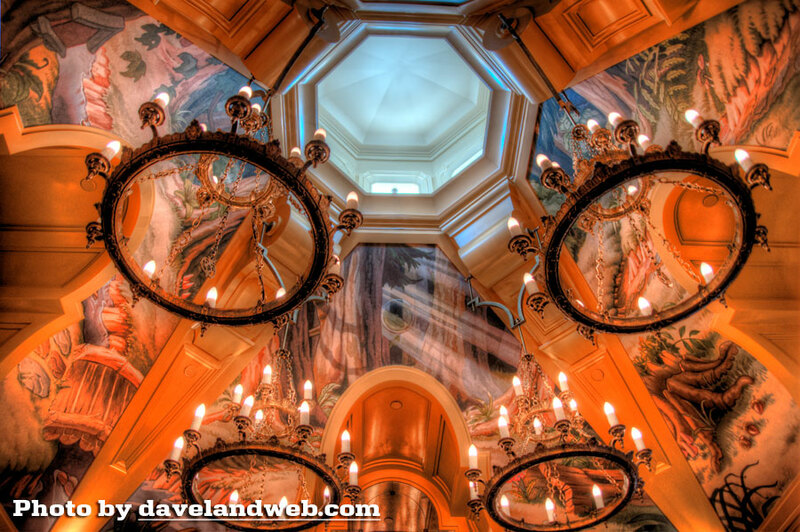 In Disney history, it is known as the theatre that presented "Snow White and the Seven Dwarfs" to the world. 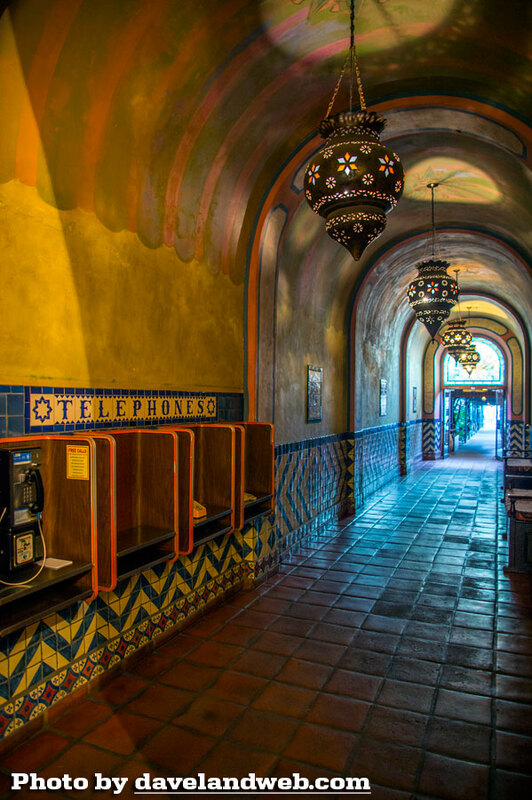 The Disneyland Resort's Buena Vista Street built a scaled replica of the Spanish Colonial Revival marvel that was demolished in 1969. 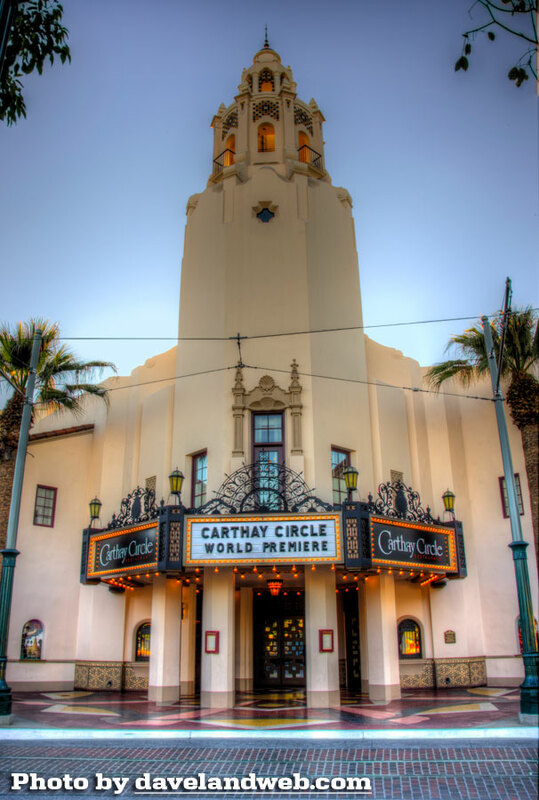 While the exterior evokes the original, Disney California Adventure's Carthay Circle functions as a restaurant, causing the interior to be completely different. 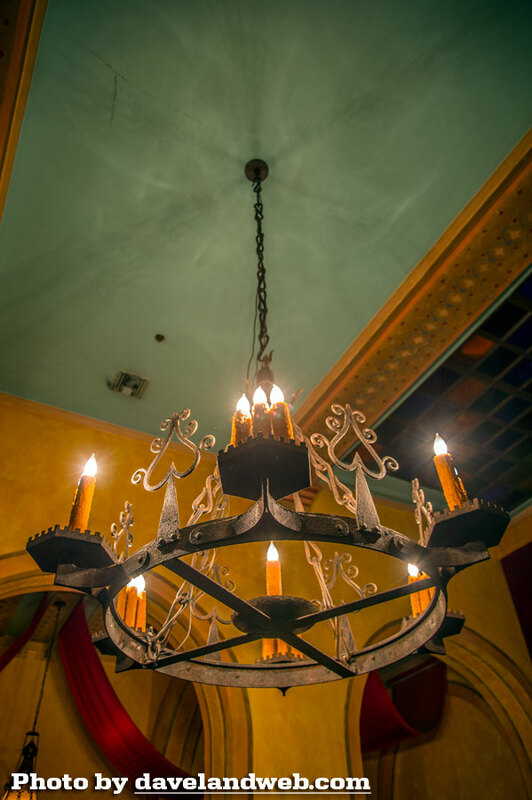 Imagineers did a fantastic job of creating a high end restaurant that evokes the golden era, but I have to admit that I was slightly disappointed when it was announced that its function would not match its namesake. 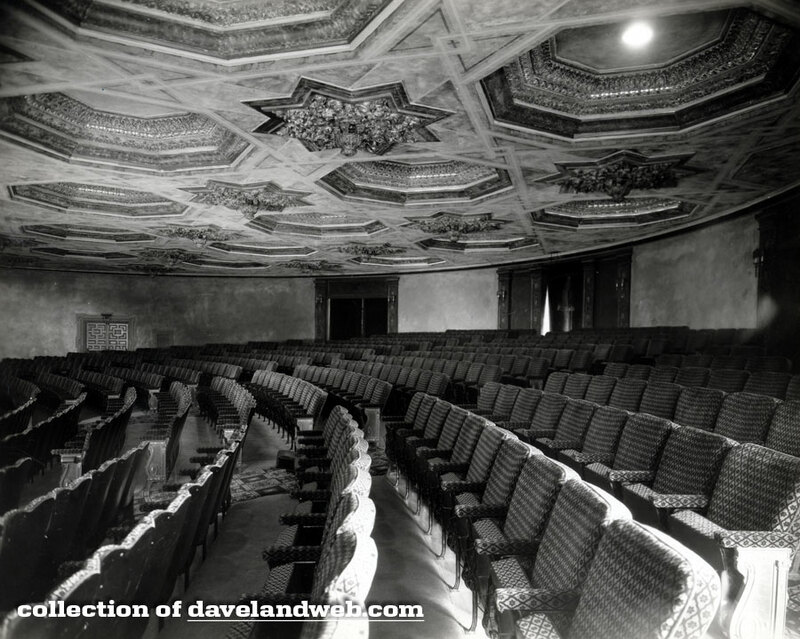 In hindsight, it was a wise choice; how many guests would want to pay money to go to an amusement park to sit in a darkened theatre to watch a movie? 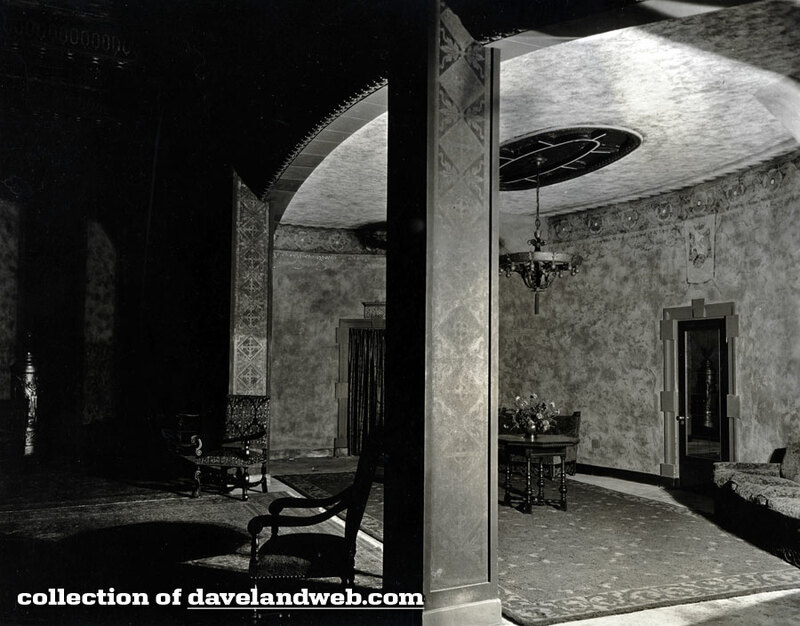 Thankfully, photos do exist of the interior of the 1926 Carthay Circle Theatre. 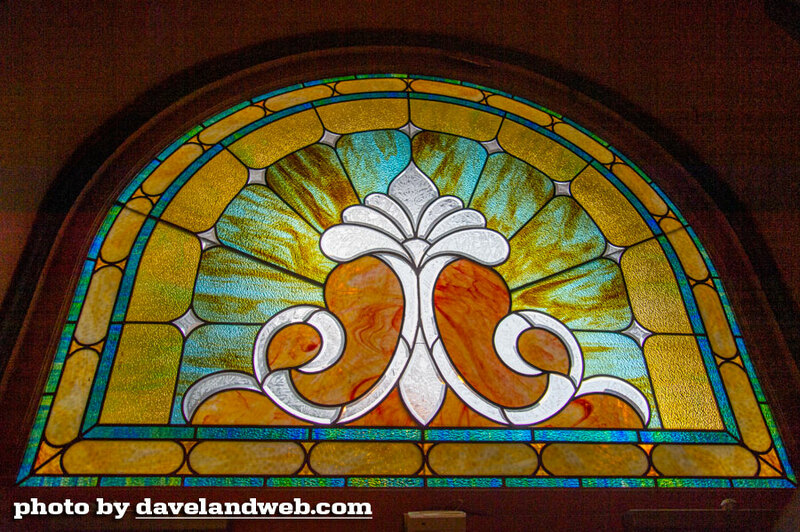 Glad you can't see me drooling over these architectural details and flourishes. 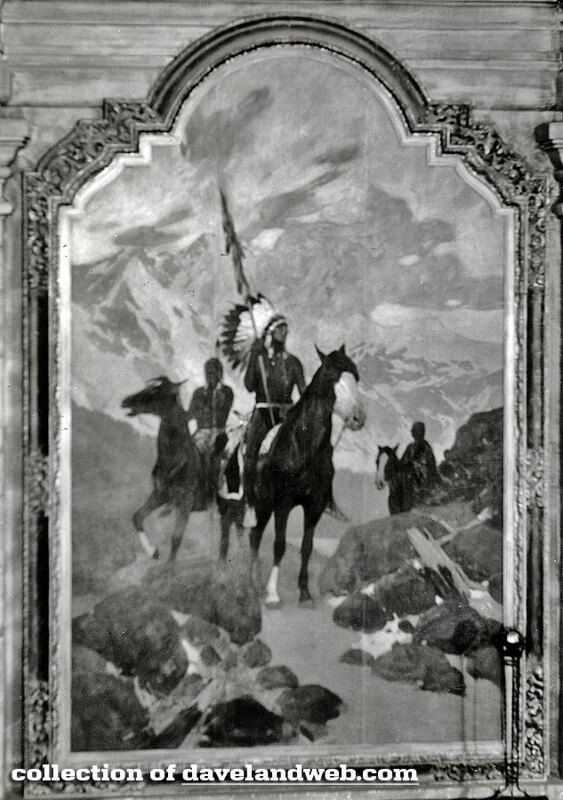 I sure hope this painting was saved. 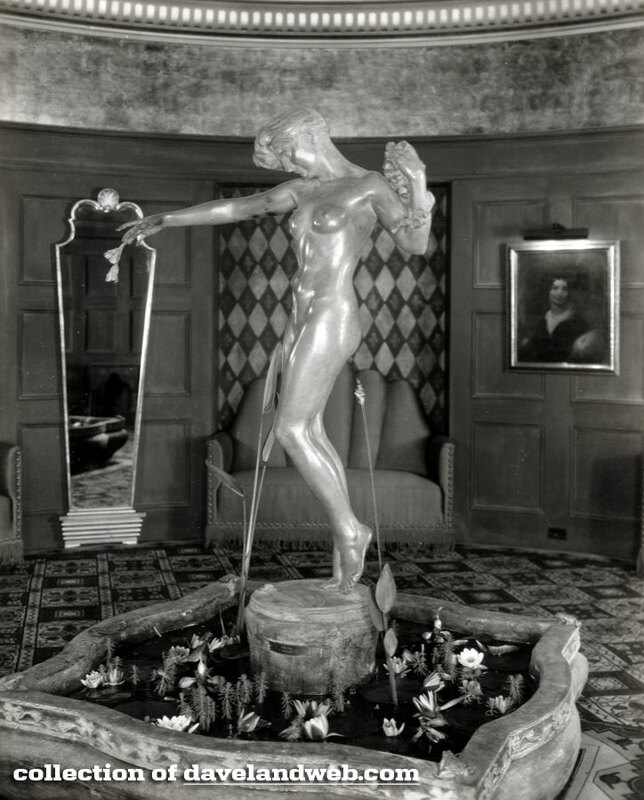 Imagineers, I am putting in my request to add this Art Deco fountain from the original! 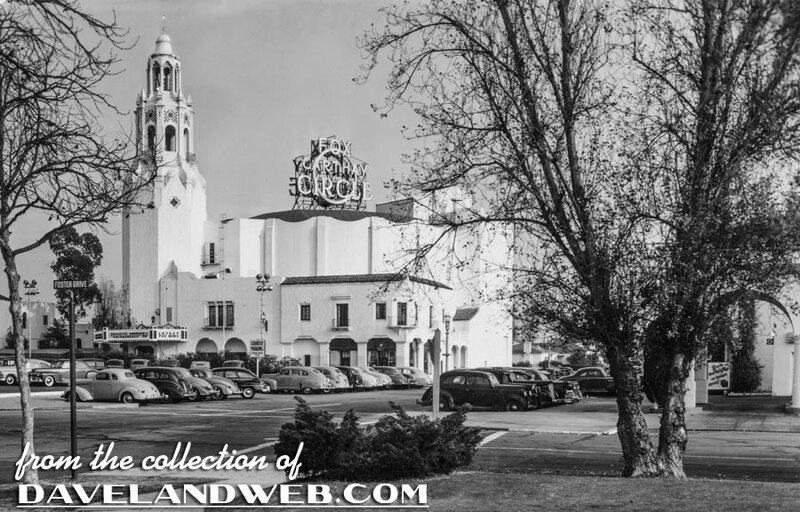 See more Hollywood Movie Palaces at main website. 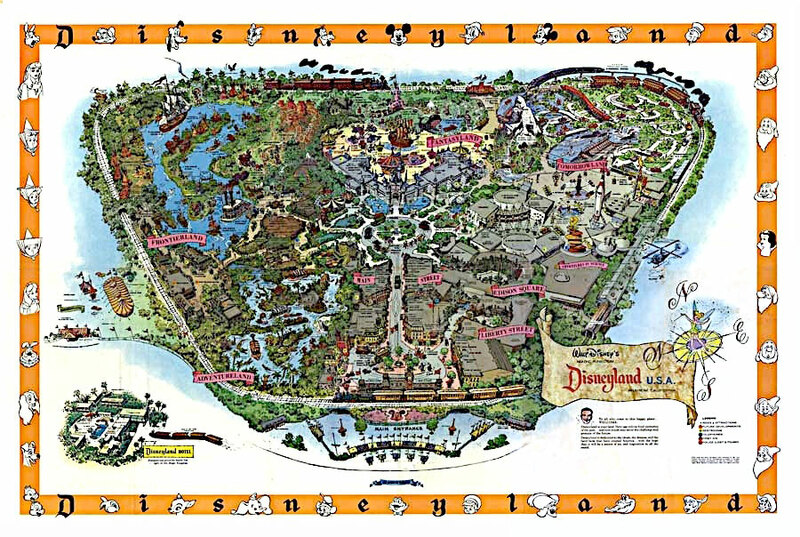 When I stepped off the train from my most recent visit to Anaheim, I was totally confused. Where the heck was I? Somebody changed the station on me! 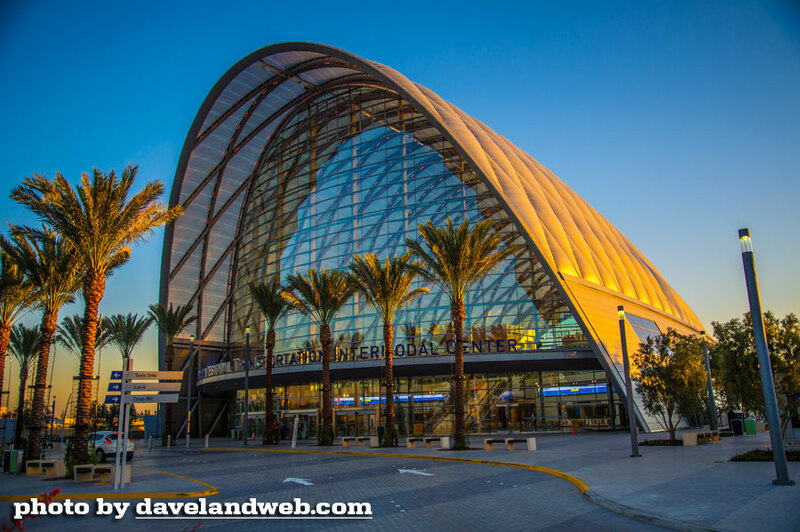 Opening in December 2014, this new facility is extremely impressive, and a far cry from the dump that still stands a few blocks away. 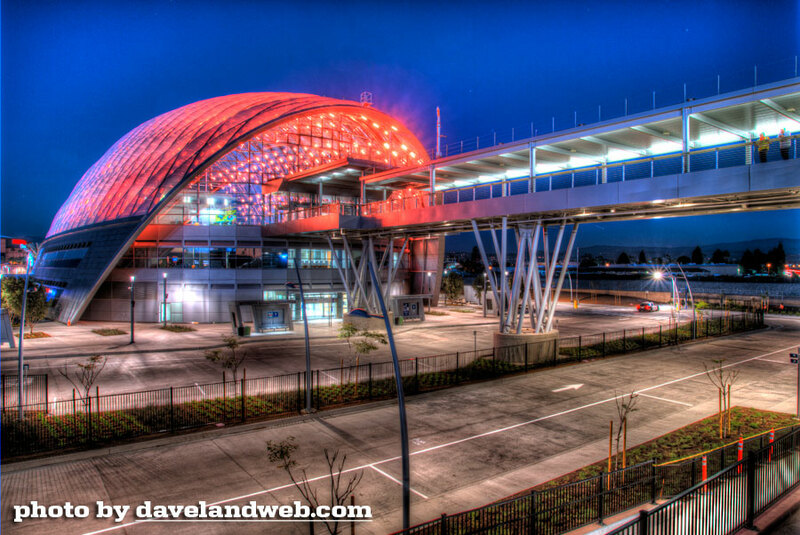 Certified LEED platinum, the ARTIC (Anaheim Regional Transportation Intermodal Center) is even more impressive at night. Inside, there are ticket counters as well as retail space and restaurants. At the time of my visit, it looked like they were still attempting to fill the retail space. 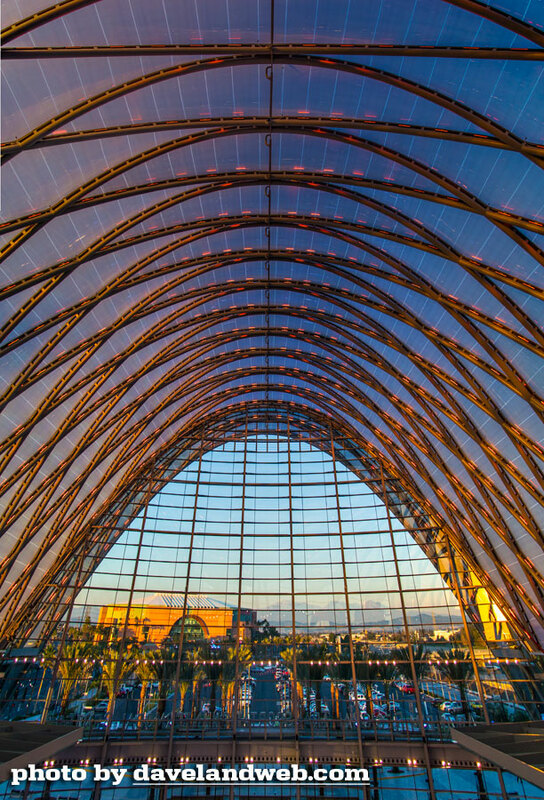 Kudos to HOK and Parsons Brinckerhoff for the impressive architecture. I was having such a good time taking photos I didn't even really mind that my train was over an hour late! 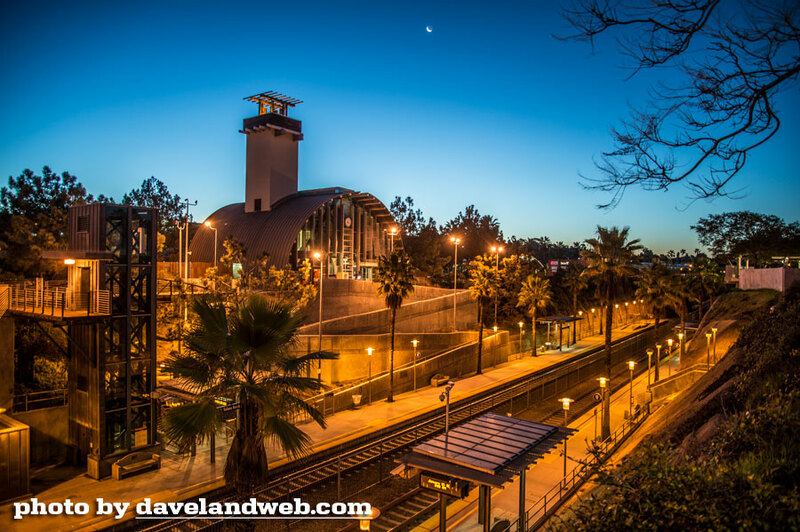 This station should do more than its share to poise Anaheim for a future of growth. 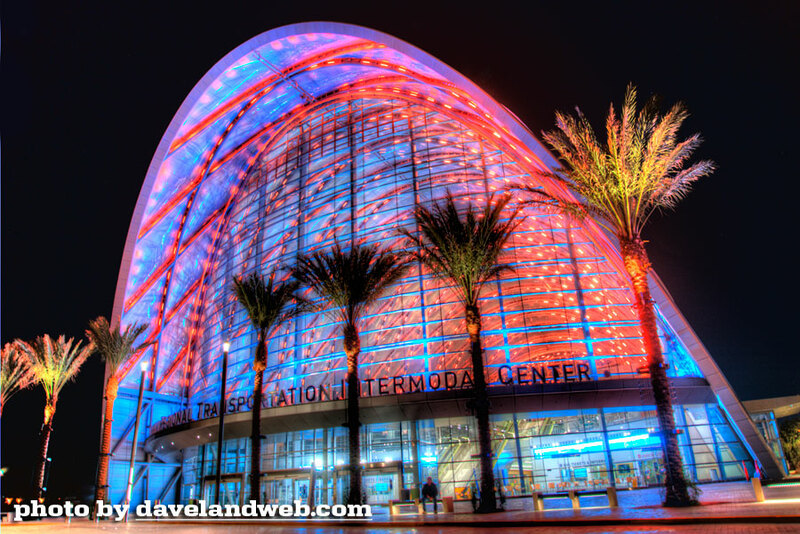 See more Anaheim at my main website. The more years I acquire, the less I care to deal with stressful situations. 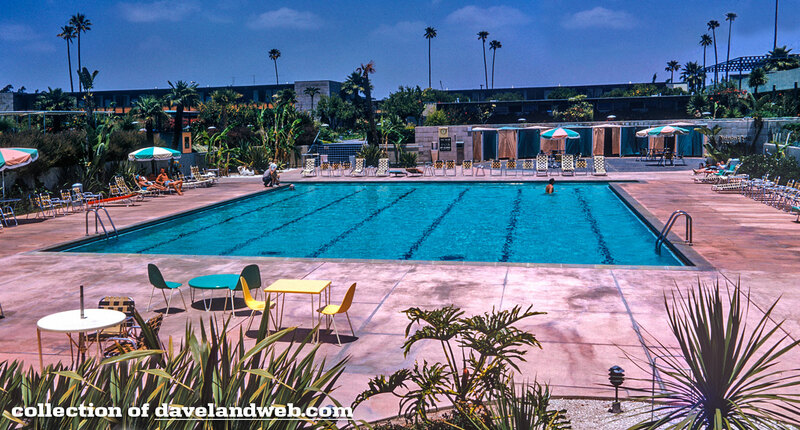 In my youth, driving on the freeways of Southern California felt so amazing; blazing at the speed of light with FIVE LANES to choose from…wow!! Now, those five lanes are typically bumper to bumper. No thank you; I'll take the train. 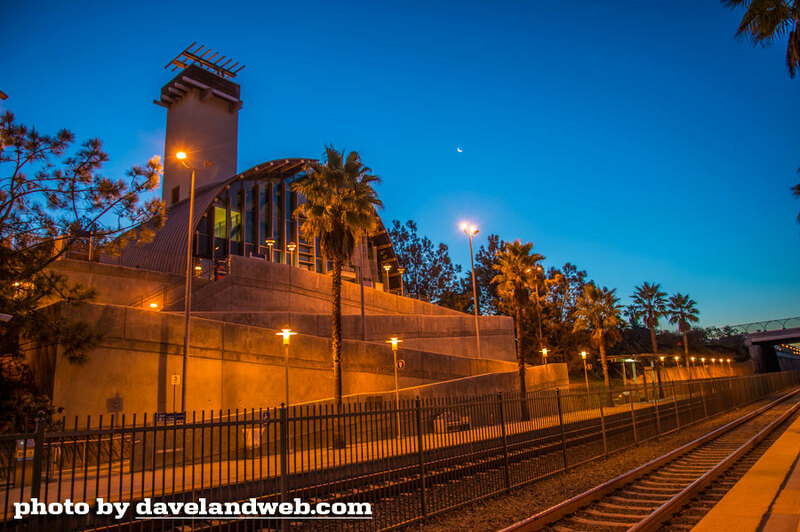 Showcased today is the Solana Beach Amtrak Station, where I frequently board for my trips to Disneyland. Quiet, peaceful, and devoid of congestion. 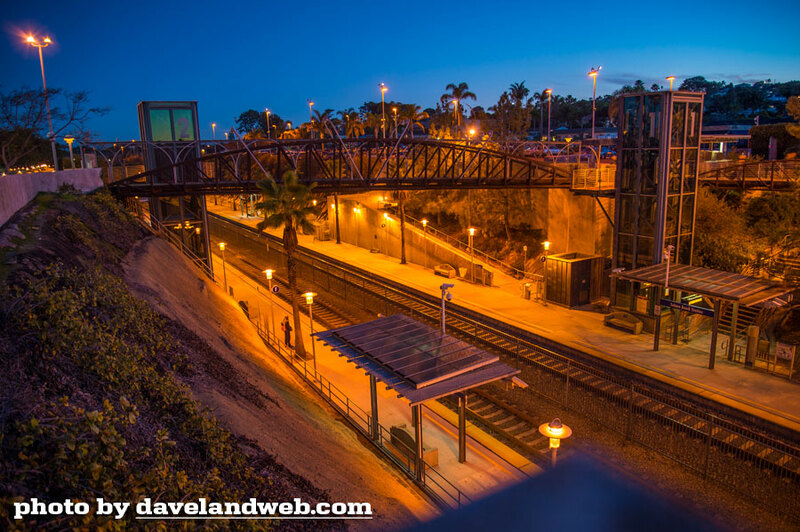 See more Daveland Solana Beach Train Station photos at my main website. 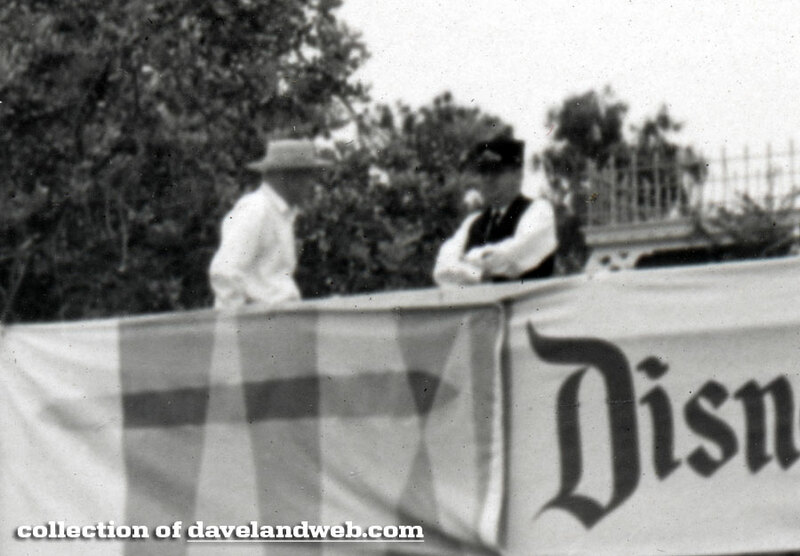 When I saw these two images from June 1961 come up for sale, I had a hunch that I could combine them and get a very cool panoramic view of the Disneyland Hotel view. I am sure that especially for my east coast readers who are steeped in snow, this is a lovely sight! 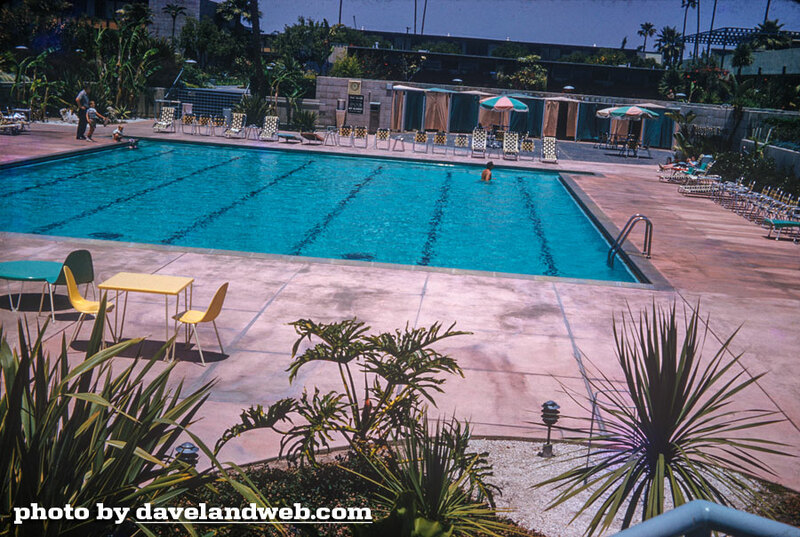 Want to spend more pool time at the Disneyland Hotel? Swim over to my main website and see the rest of my collection. Welcome back, Possums! It's positively spooky how I have managed to stretch one GLORIOUS evening into three posts. 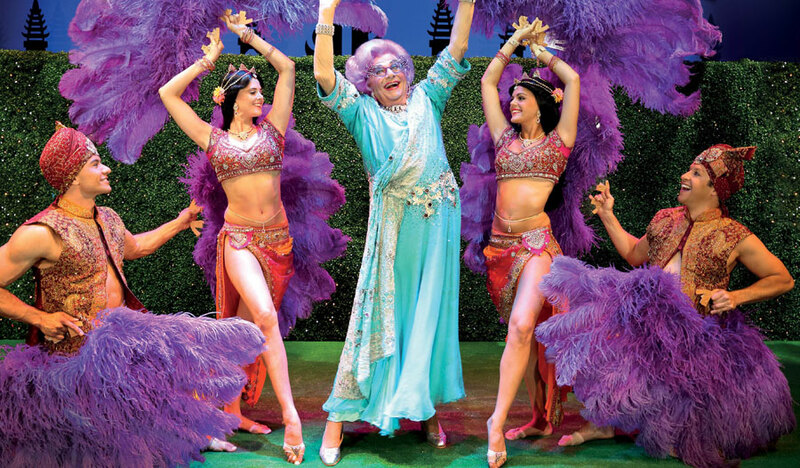 For the handful that have never seen or heard of Dame Edna, please go over to Youtube and rectify the situation. Then come back here. 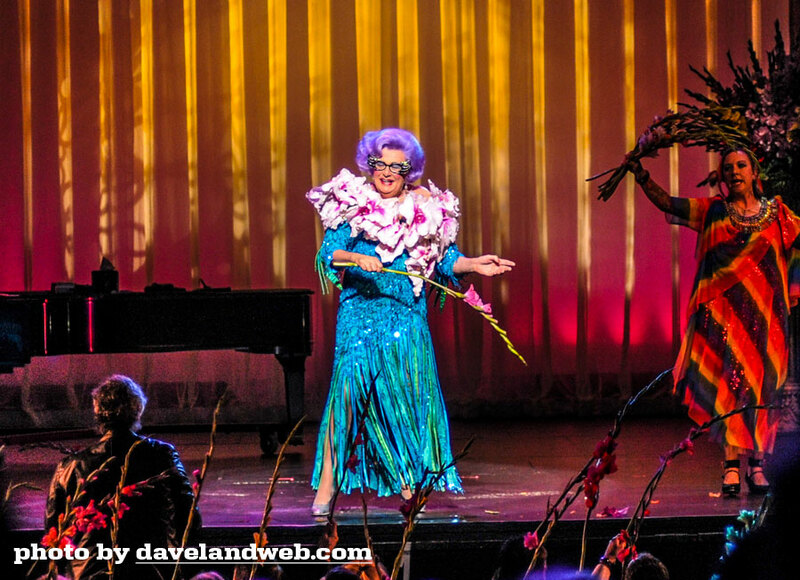 This was the third time I had seen Dame Edna in person; once on Broadway in 2005, followed by San Diego in 2009, and most recently at the Ahmanson Theatre in Los Angeles. 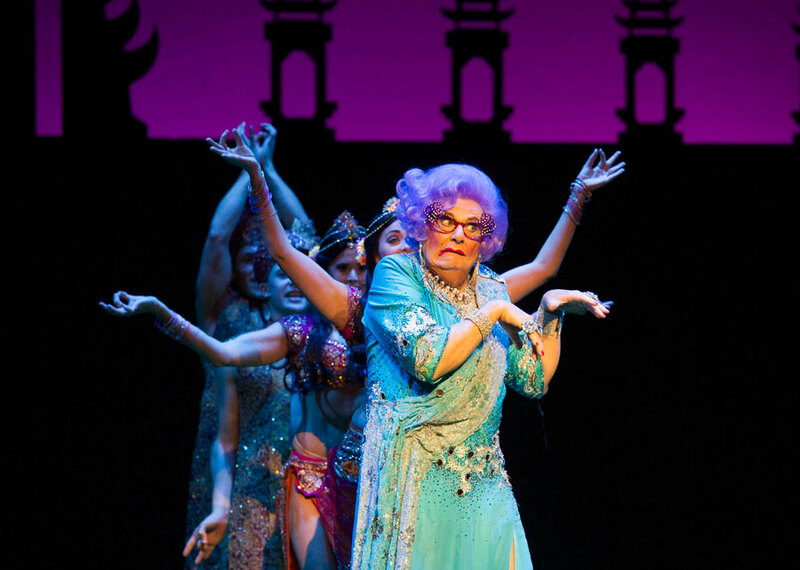 Played by the 81-year old Barry Humphries, Dame Edna is still making audiences roar with her impeccable comic timing and rubbery face. Even though there is much that has been recycled in this particular outing, I would rather hear Dame Edna re-tell the same joke repeatedly than hear a fresh one from some of today's comics who think that shouting and using profanity is what brings a laugh. The format of "Glorious Goodbye" is very much the same as the other two shows I attended; a few funny videos, picking on audience members, and the obligatory throwaway song and dance numbers. Why mess with success? 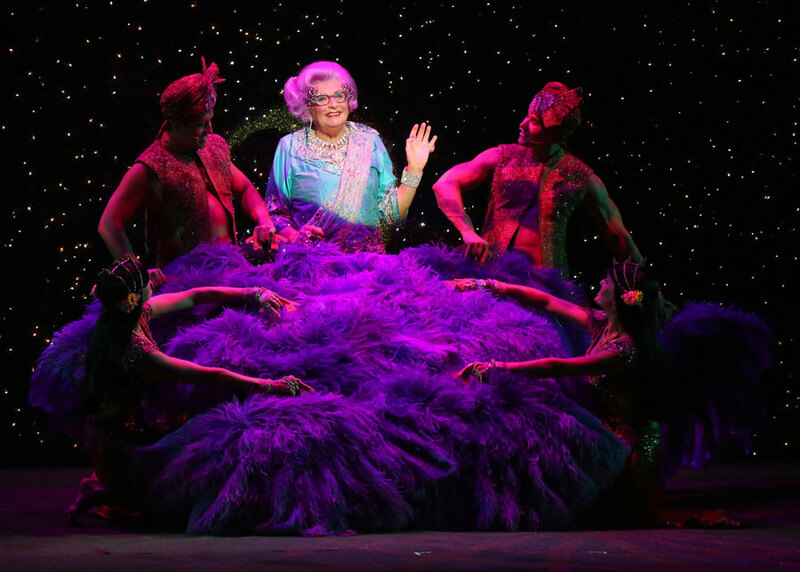 The audience interaction is what I love most about a Dame Edna show. I can now vouch that none of them are plants, as she singled out three from my party during the evening. 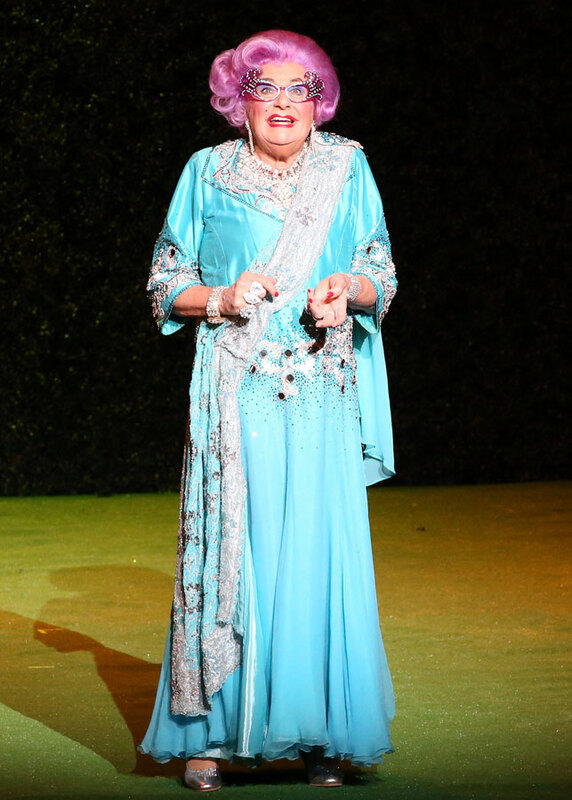 Dame Edna loves to talk about the poor bastards who have to sit in the balcony, kindly referring to them as "Les Miserables." She also took the time to explain why there were empty seats sprinkled throughout the massive theater: "These are seats owned by people we call Subscribers." These wealthy patrons purchase a series and then go onto the great beyond, leaving behind these "beige plush tombstones." 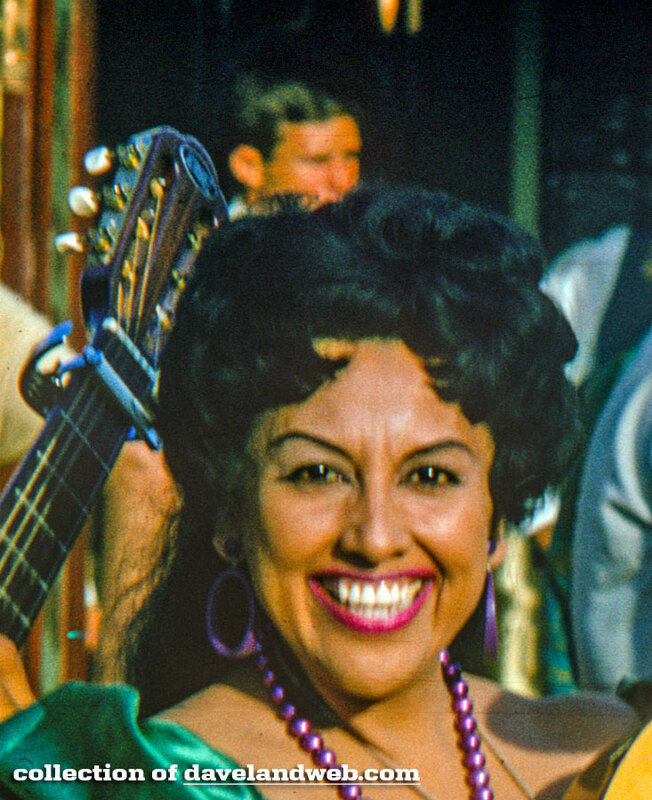 Edna typically singles out a living Subscriber and dubs them "Senior," referring to them throughout the show and stirring them out of a coma with a flash of her saturated bedazzled dress. One attendee made the mistake of getting caught reading her program by Dame Edna in the middle of the show. She quipped about how this literary ticket-holder was pondering what to do this particular evening: "Today I feel like a good old read. 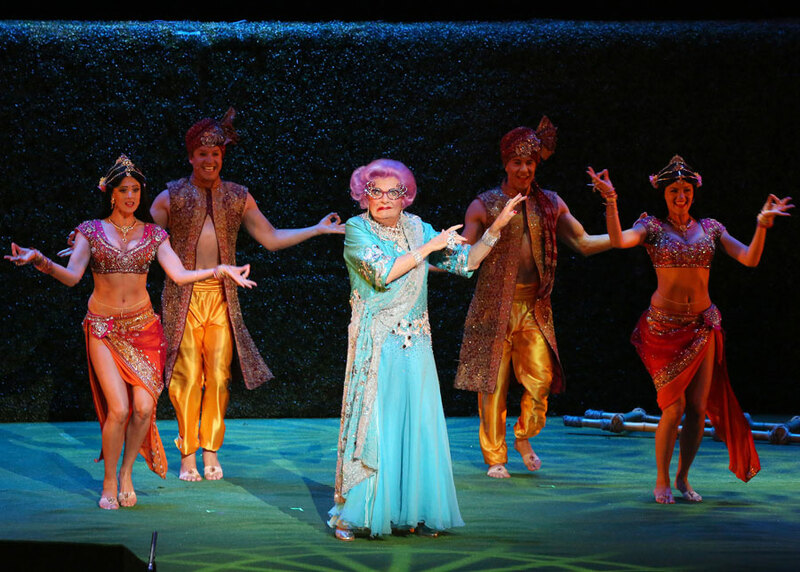 I know, I'll go to the Ahmanson and sit in the third row of Dame Edna's show!" 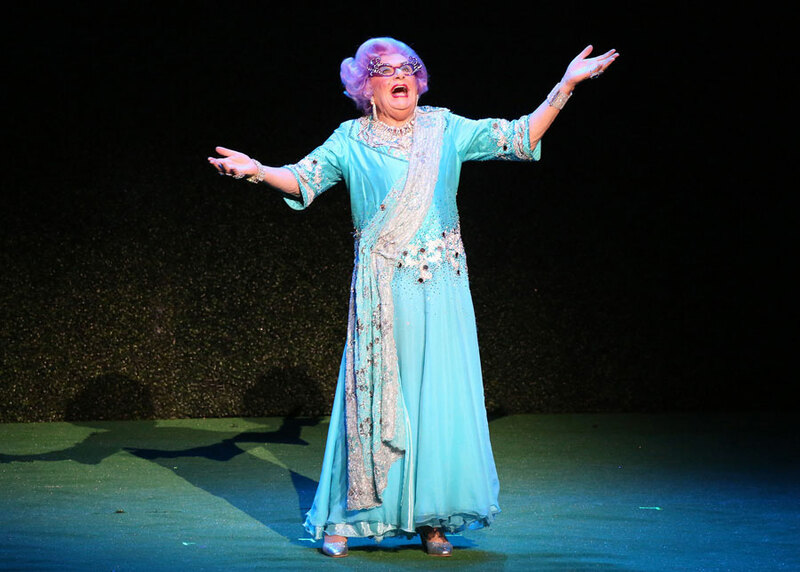 Fashion is a standard topic for Dame Edna, as she usually assails the audience members for not dressing up for the show. “I see you dressed for a special occasion…like washing your car.” When she found out one of the people in our party was retired, Dame Edna asked her if she had any regrets in life…"besides your hair dresser?" Humphries may recycle a few gags, but he also stays topical. 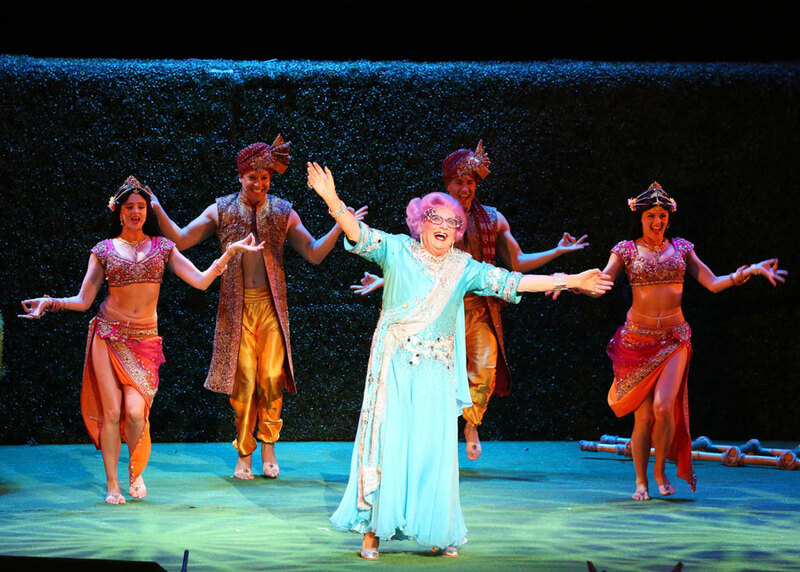 Dame Edna defends her habit of picking on the audience with her criticisms, stating that they secretly crave it, like the apostles and Jesus. How could the Apostles complain, reasons Edna? "They ended up with four best sellers. The Gospels were "the 'Fifty Shades of Grey' of their day." 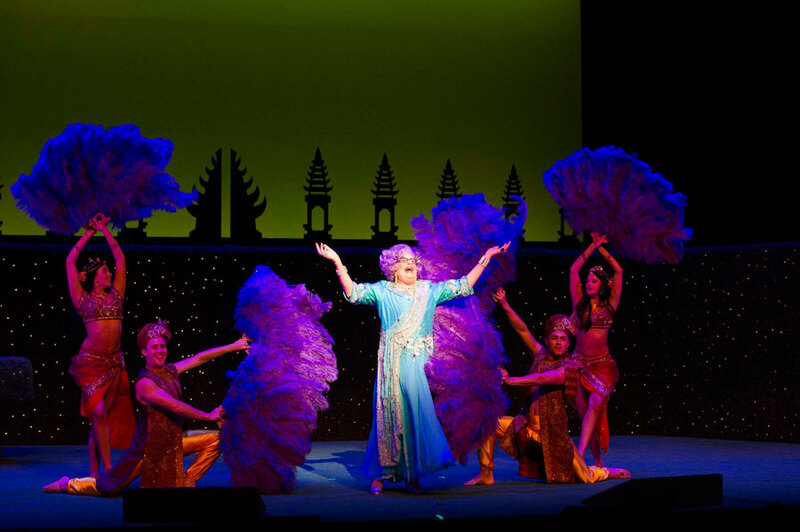 Real Estate is another standard topic for a Dame Edna show, asking audience members about the homes they live in. 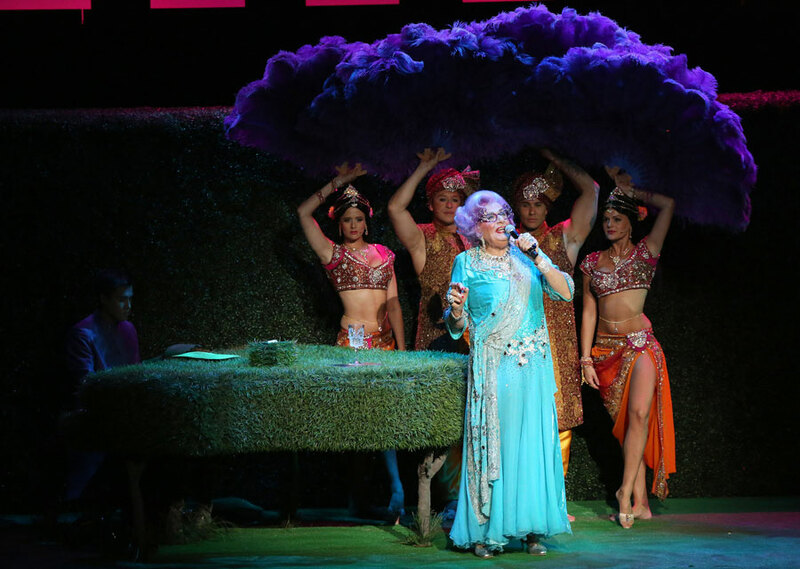 When one audience member said the color of her house was taupe, Dame Edna screwed her face up and minced, "Oh taupe…I had almost forgotten about that color! I am sure it will come back into fashion at some point!" 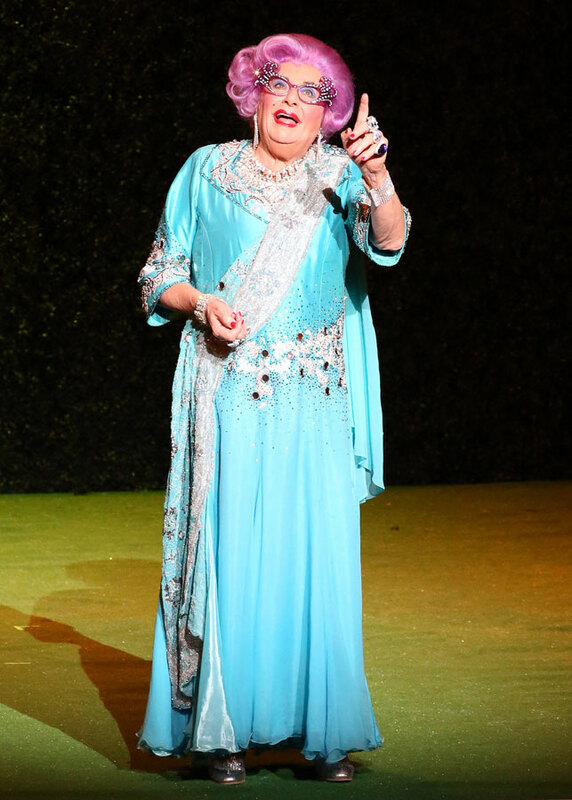 One of Edna's final jokes came about at the end of the show when she was throwing out her gladiolas. She asked one African-American gentleman to wave his gladiola to her; his had broken off and was quite short, yet he did his best to "wave" it to Edna. "Well, we just disproved another long-standing myth!" If our Glorious Gal of the Gladiolas came back to the States for another tour, do you think I would attend? You betcha'! 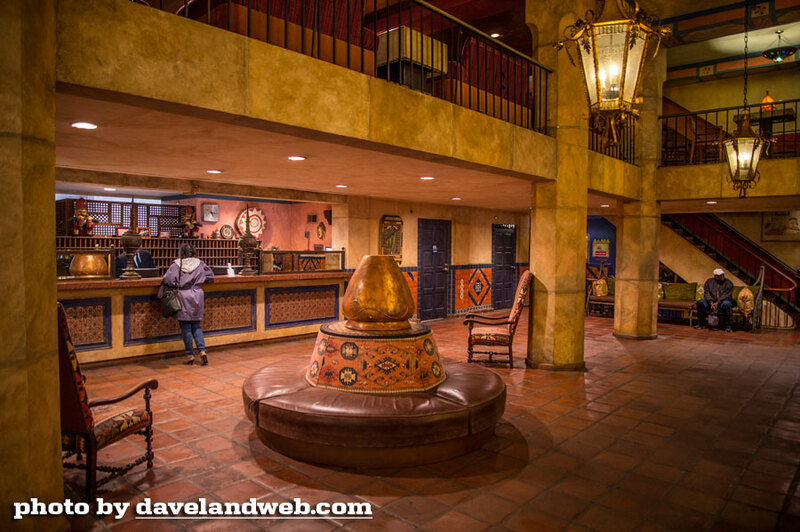 Want more of the Daveland Experience? Check out my main website and lose yourself on this GLORIOUS Sunday!. 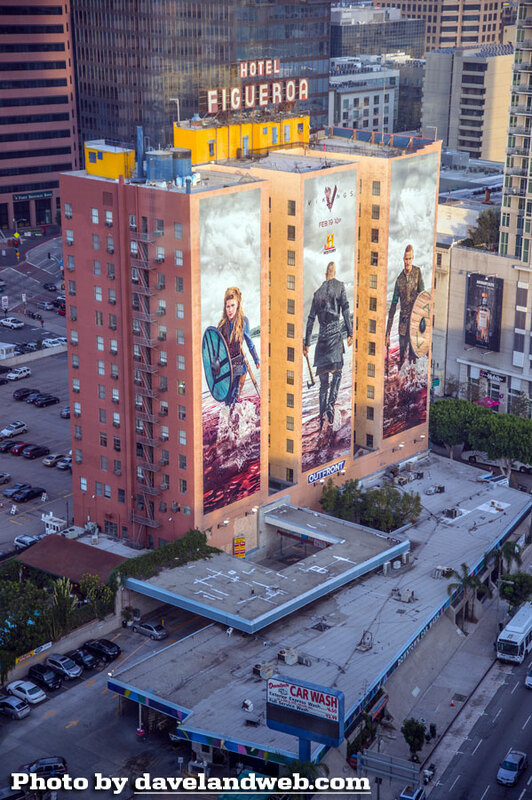 When last I had your attention, we were looking out over the Figueroa Hotel from the 24th floor of the Ritz-Carlton in downtown Los Angeles. 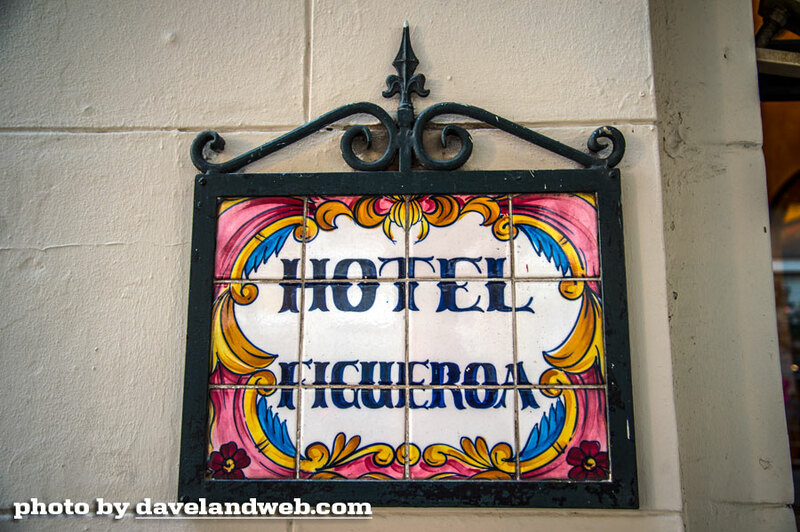 I had checked it out online when we were considering staying overnight and from the website, the Figueroa looked incredible. From the 24th floor, it looked a little sketch. 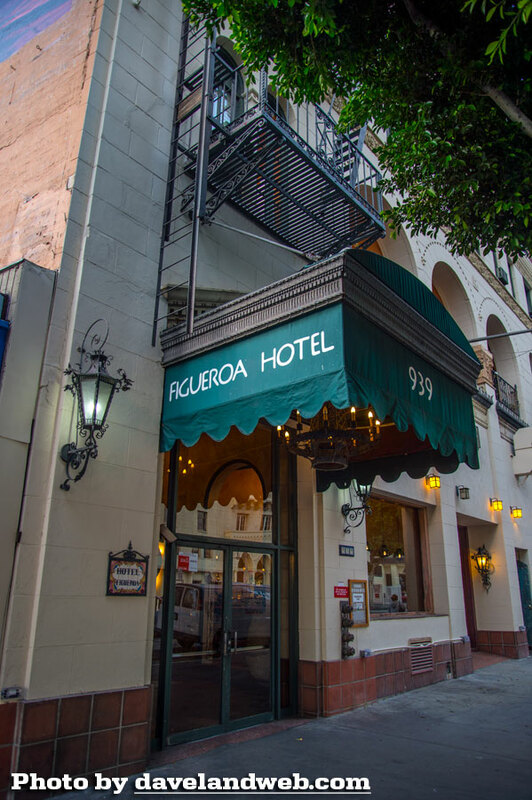 With a car wash and Mexican Restaurant next door, The Figueroa seemed like it might be more like a flophouse than the beautiful Moroccan-styled hotel seen online. 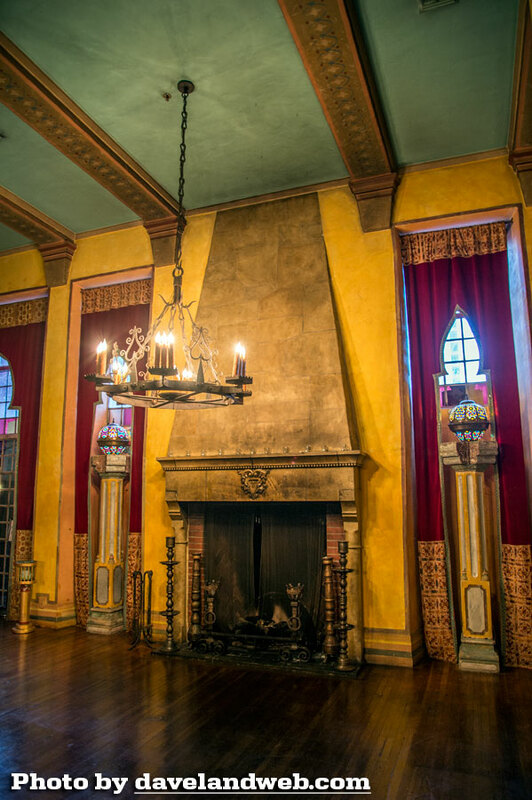 Built in 1925 as a YWCA hotel, Hotel Figueroa became a victim of the Great Depression, forcing it to expand its customer base. 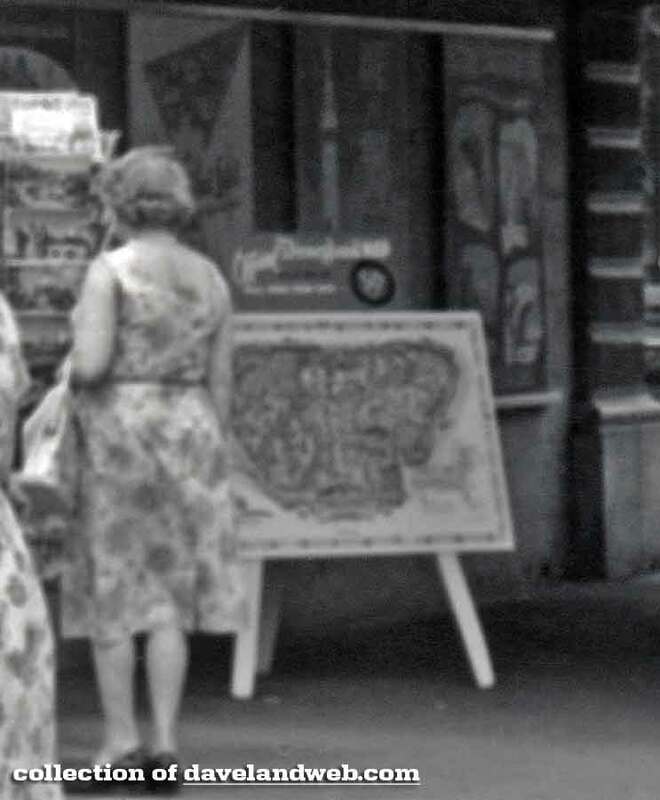 Still, it continued to be a special place for women, hosting exhibitions, lectures, concerts, and presentations by female artists and influencers. 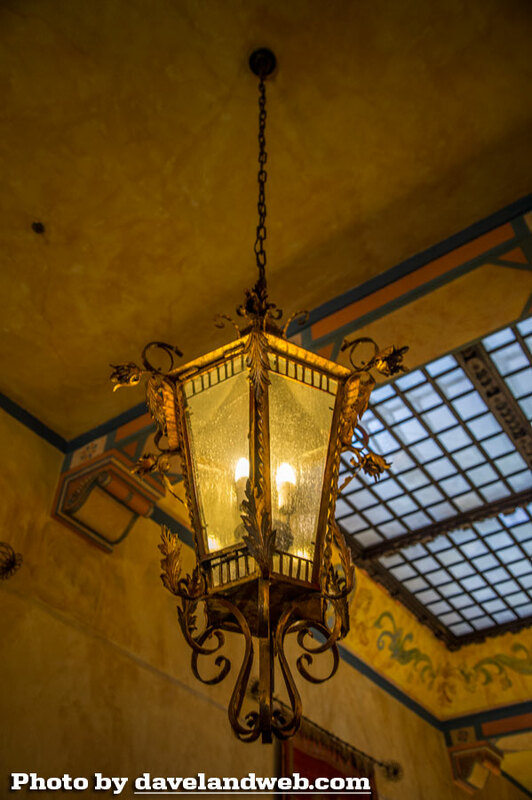 Over the years, the hotel has changed hands and stylings; the website promises that the rooms themselves are currently undergoing a makeover. Based on some of the Yelp reviews from last year, that is probably a wise move. The outdoor entrance is pretty enough with this welcoming tile sign, but nothing would necessarily cause you to look twice. Once inside though, I was thoroughly amazed. 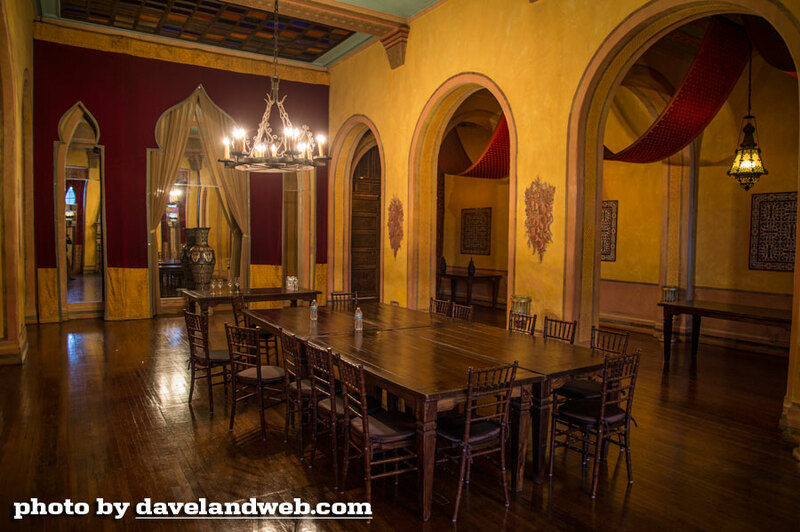 This place looked like it would be right up my alley of interest, with its 1930s Hollywood bones with a little Moroccan flair to spice it up. This geek was in hog-heaven. I would definitely stay here the next time I am visiting downtown; I only hope that the rooms and the service match. 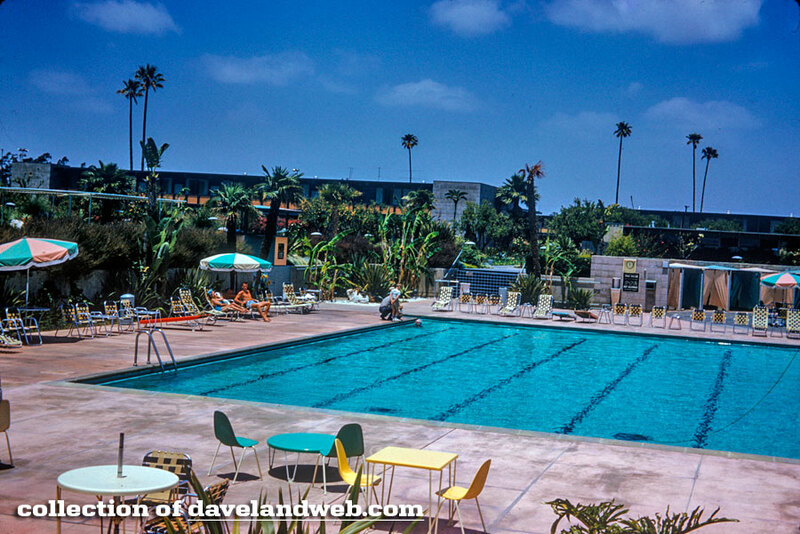 Anybody out there ever stayed here? 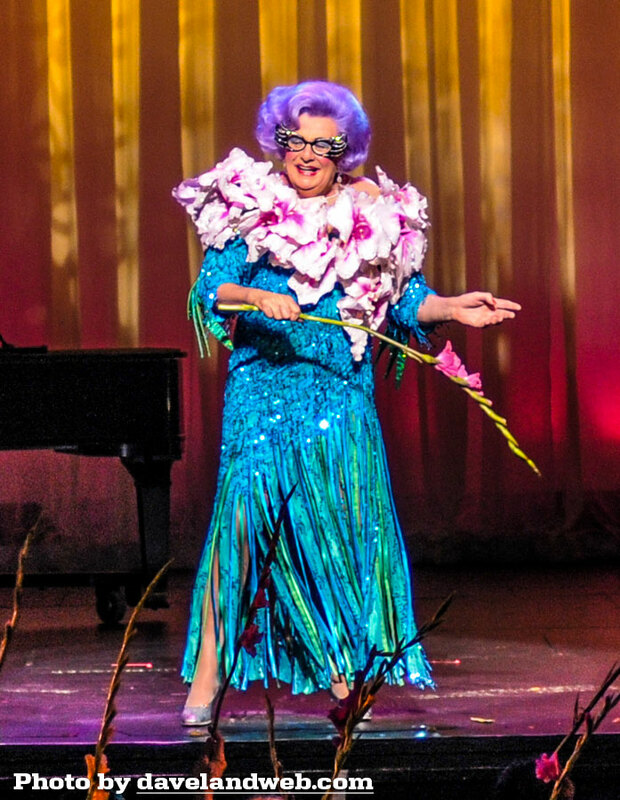 Don't worry, possums; I haven't forgotten about Dame Edna. She makes her appearance tomorrow! 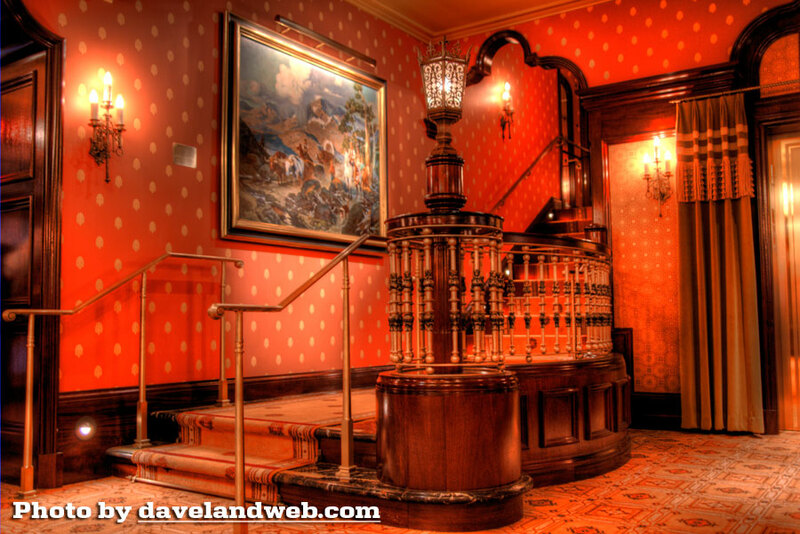 If you need help picking a great getaway hotel, go to my main website and see more hotel photos.